If every person in the world reads Mirjana’s best-selling auto-biography, there would probably be peace among mankind. We know that’s an impossible dream, but surely if more people read My Heart Will Triumph, then the world will at least be a better place. In hopes of spreading the book far and wide–and to give ministries, parishes and individuals a way to earn extra funds–CatholicShop Publishing has created two wonderful ways in which you can partner with them to promote My Heart Will Triumph. You can earn funds by helping to promote the book online. Anyone can join. Post a link or image on your website, blog, Facebook page, Twitter or elsewhere and earn 10% of every copy of My Heart Will Triumph purchased by anyone who clicks the link. Finally, simply post the links and banners online, and promote and share them, and CatholicShop.com will send your commissions. CatholicShop Publishing invites you to be an apostle of Our Lady’s important messages by sharing this book with as many people as you can. Word of mouth is one of the most important ways to tell people about My Heart Will Triumph. As an Apostle Affiliate, you become an ambassador for the book, and for Our Lady’s message. HOW IT WORKS: Purchase the books in bulk (minimum of 10 books) at our bulk price ($11.97 each or less), and sell them at the MSRP ($20). This in-person affiliate program is ideal for members of book clubs, prayer groups, individual ministries, parish groups, and any other venue where you have the opportunity to speak to groups of people. 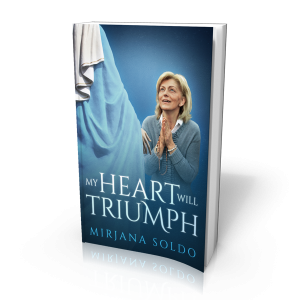 Sign up today and get a free My Heart Will Triumph T-Shirt to wear when you present the book, PLUS one free bookmark with every book you purchase. That way, CatholicShop.com knows to include your free items!